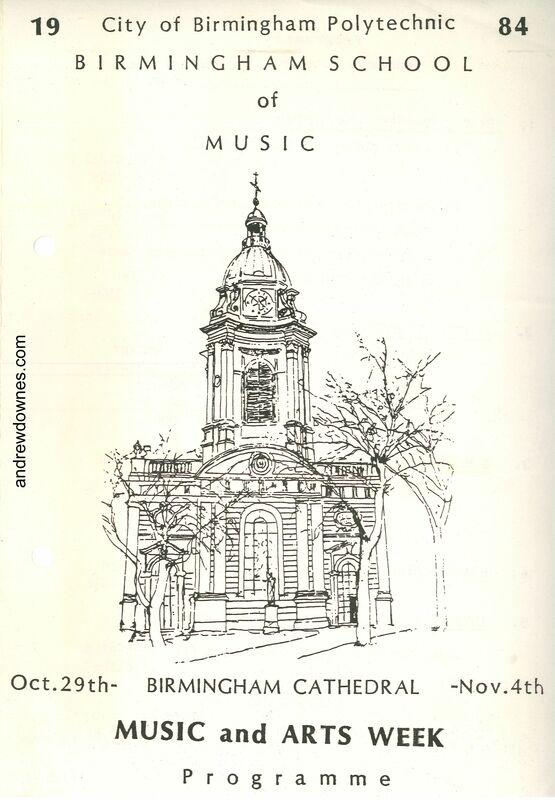 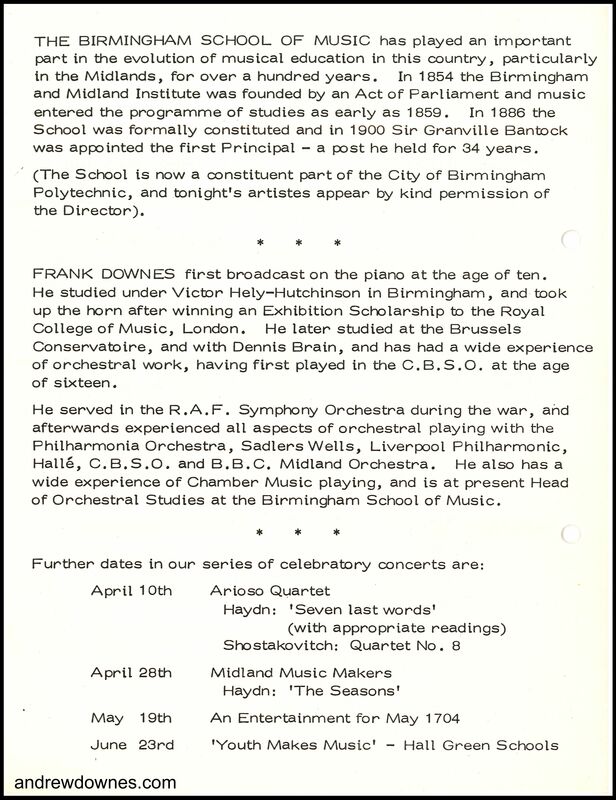 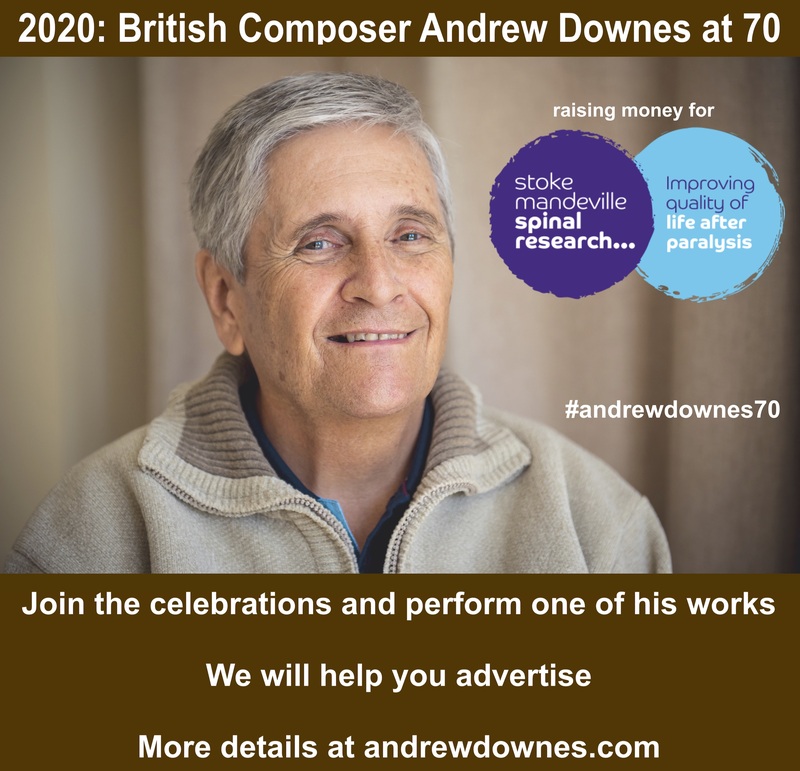 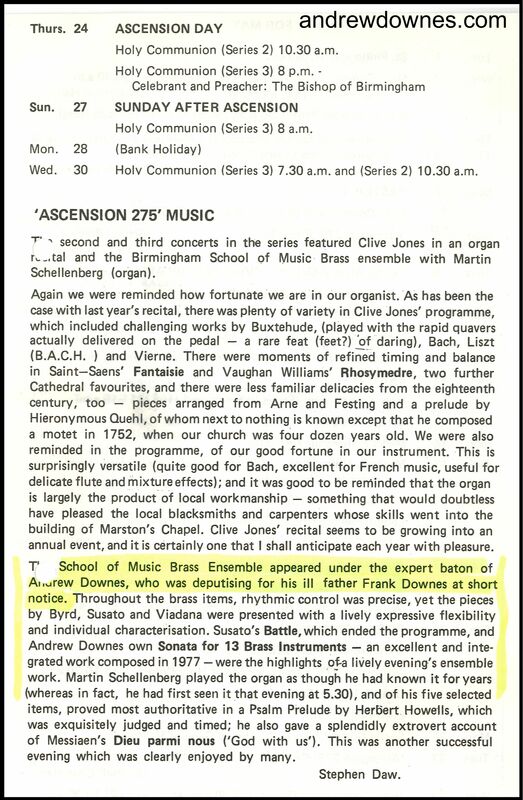 Frank Downes (1921-2005): Horn player, Pianist, Conductor, Head of Orchestral Studies at Birmingham School of Music/Royal Birmingham Conservatoire, father of Composer Andrew Downes. 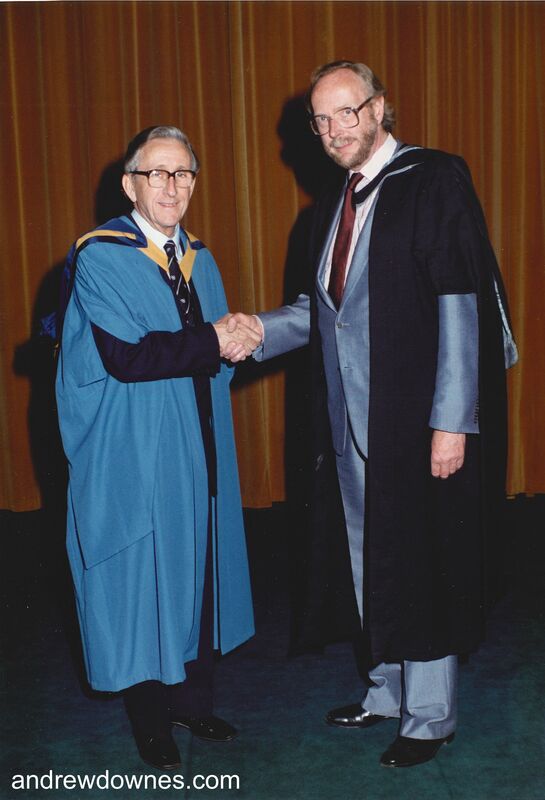 Here he is at his Open University Graduation Ceremony, shaking hands with Donald Burrows, OU Professor of Music. 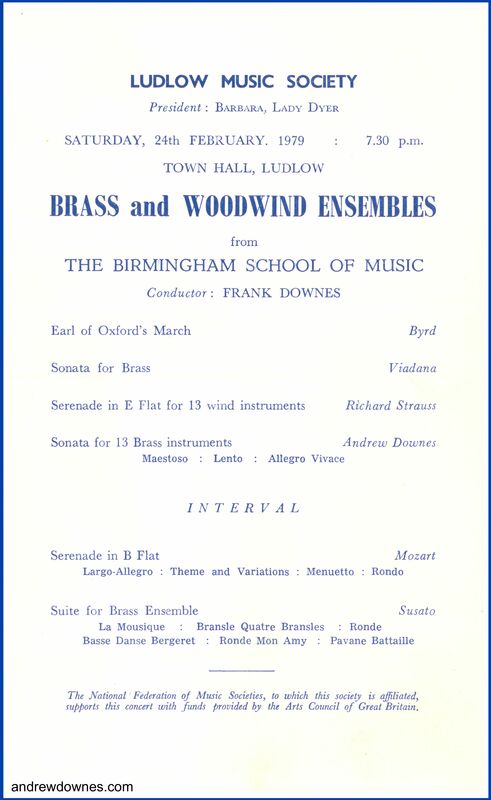 The Brass Ensemble of the Birmingham School of Music (now Royal Birmingham Conservatoire) was brought to an amazing standard in the 1970s and 80s by Frank Downes, Andrew's father. 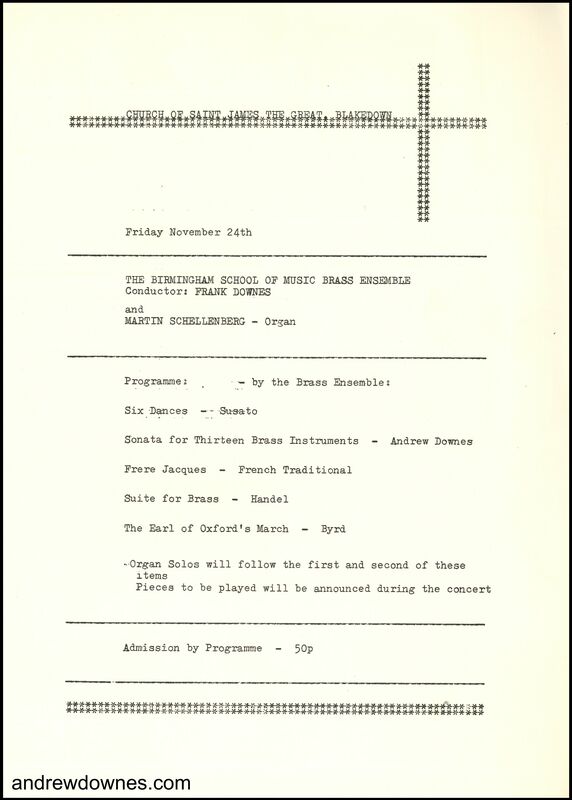 As a result of their excellent playing, they were invited to perform in Open University ceremonies all over the country (read more here). 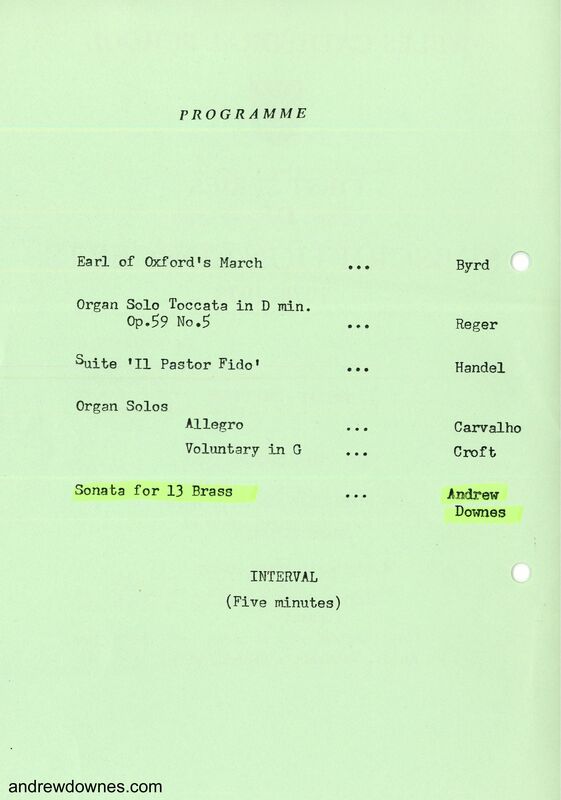 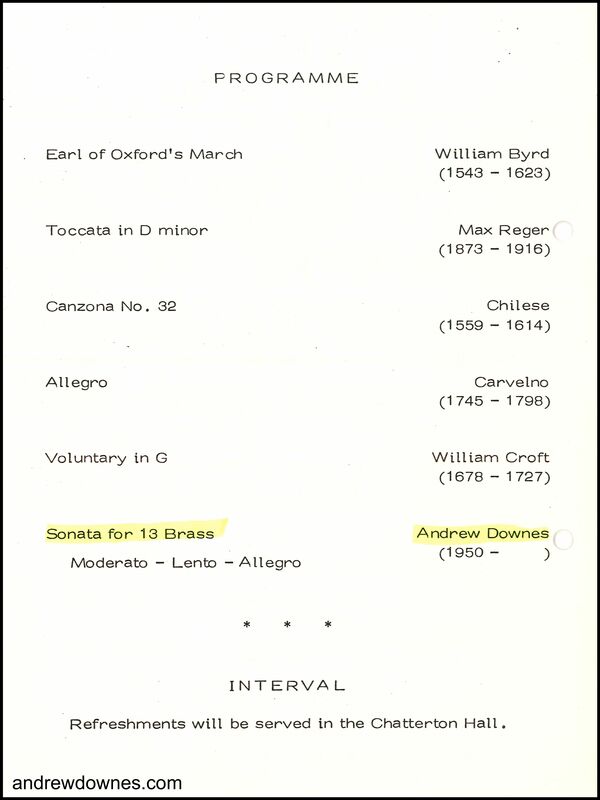 Andrew was inspired by their playing of his Fanfare for a Ceremony and composed his Sonata for 13 Brass Instruments (6 trumpets, 4 horns, 2 trombones and tuba) for them. 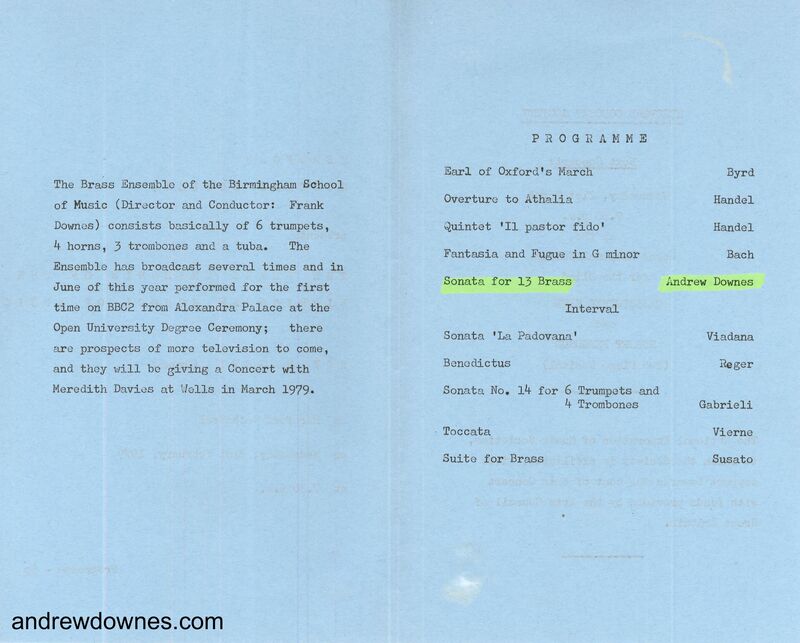 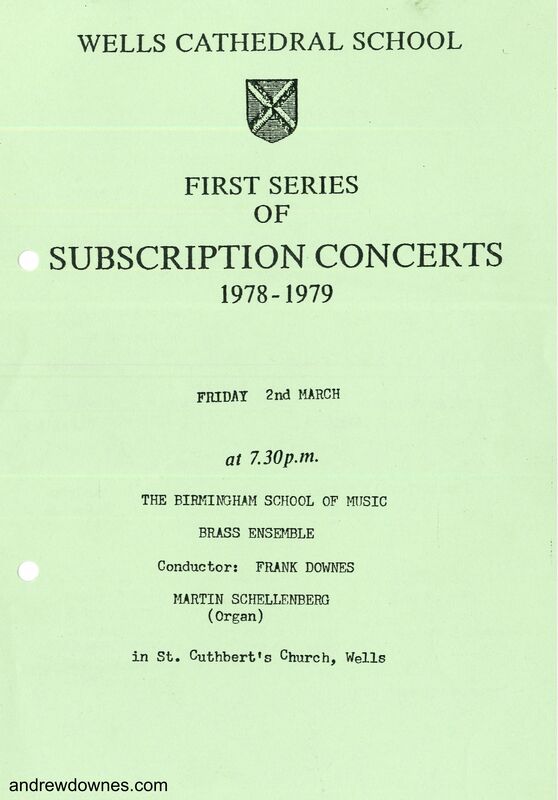 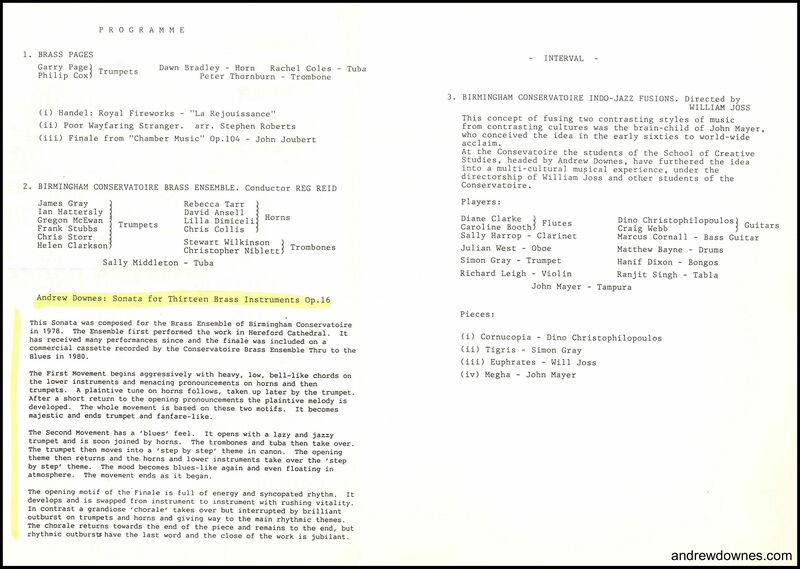 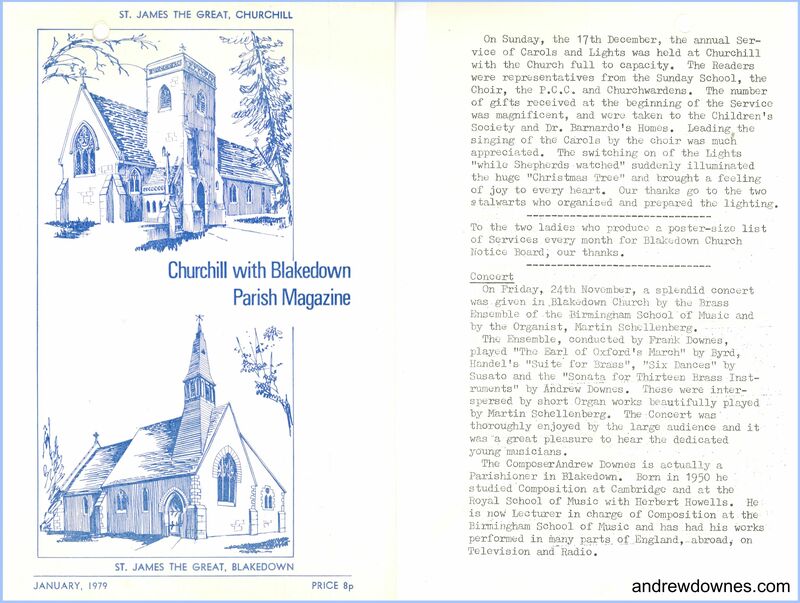 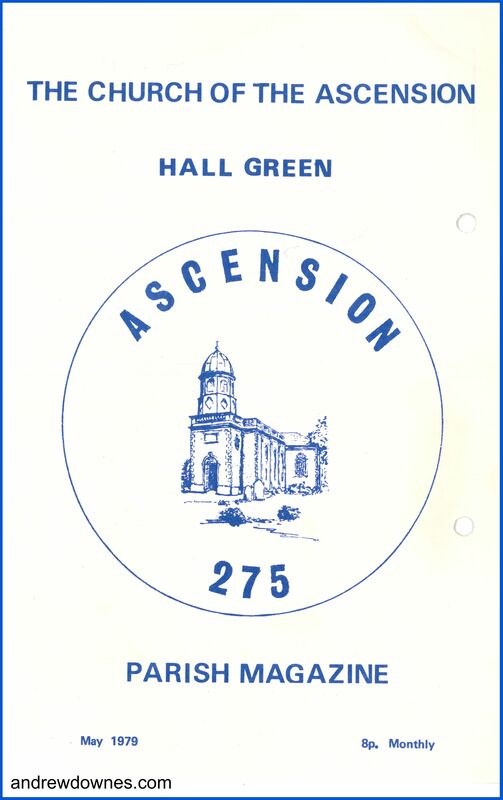 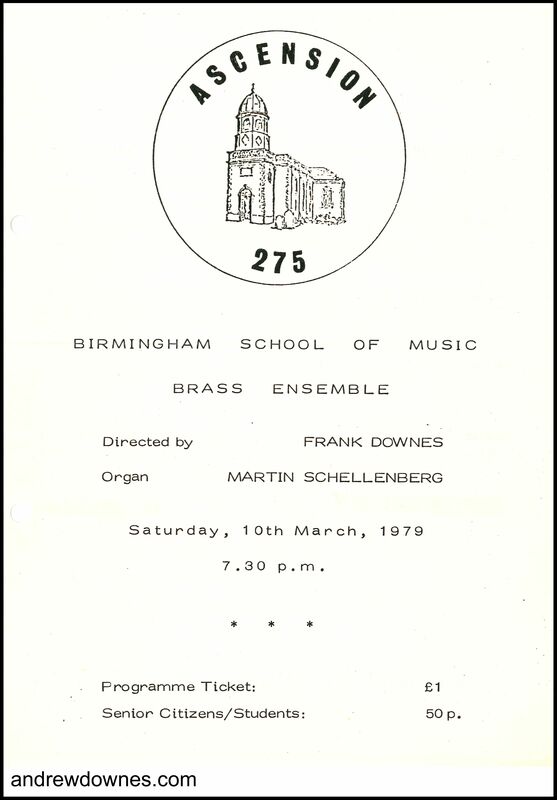 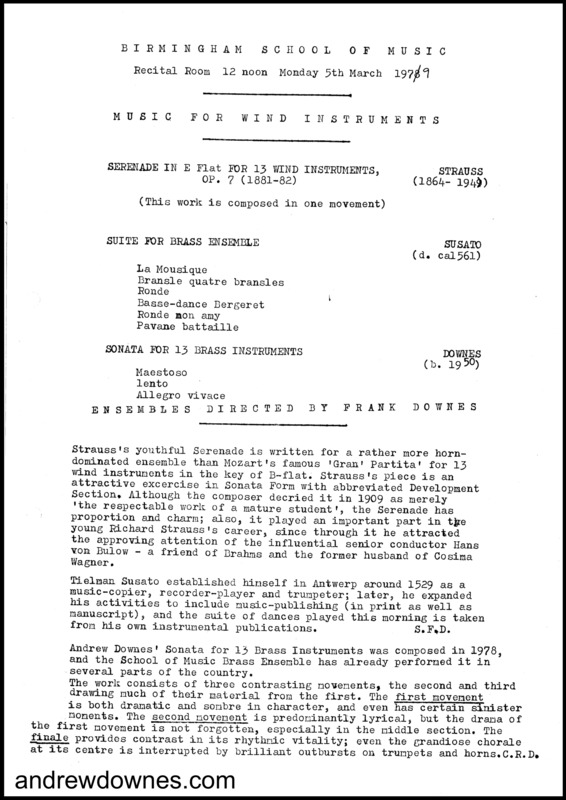 The BSM Brass, directed by Frank Downes, premiered the work in the Recital Hall of the Birmingham Shool of Music on March 3rd 1978. 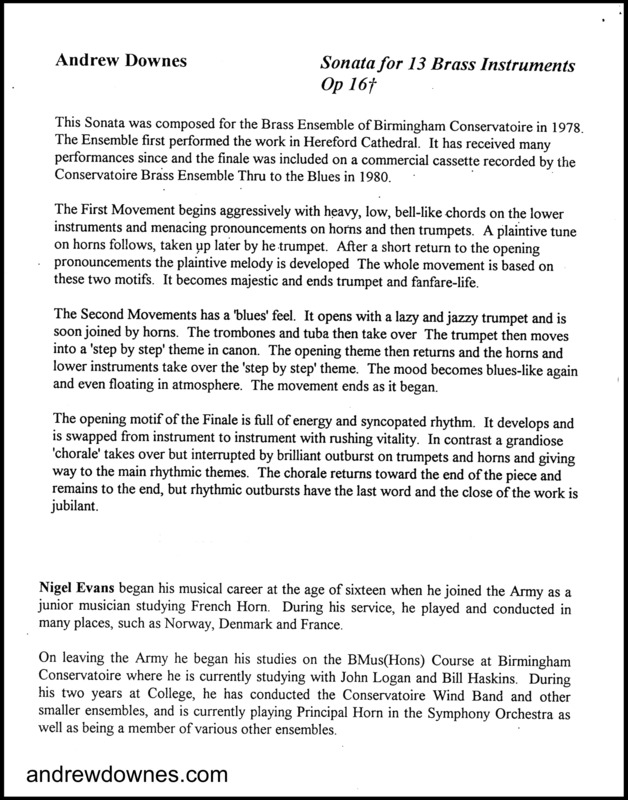 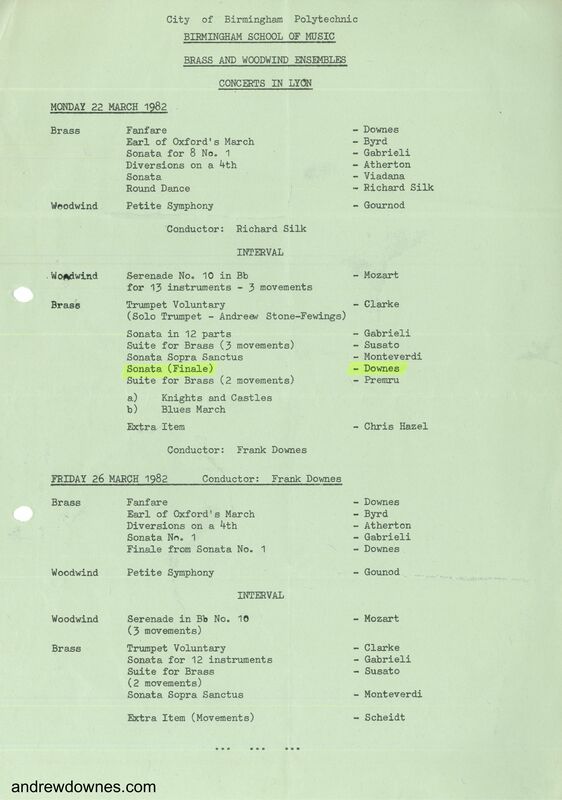 After Frank Downes' retirement, Reg Reid took over the direction of the Birmingham Conservatoire Brass Ensemble. 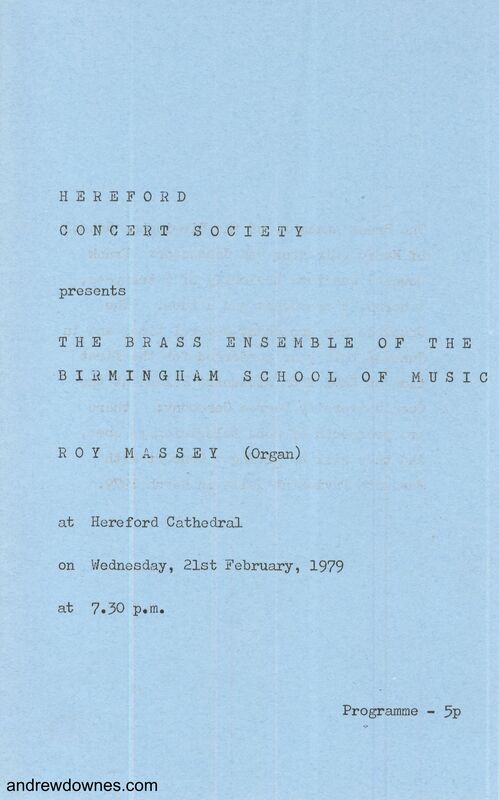 Under the baton of Reg Reid, and students Nigel Somerville and Nigel Evans, they gave a number of performances in the Adrian Boult Hall and Birmingham Cathedral. 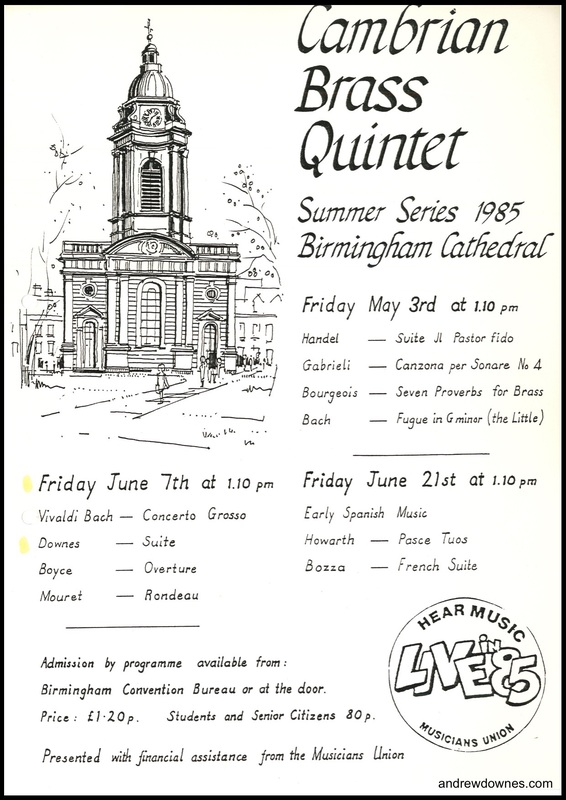 5 members of the Brass Ensemble - Richard Adams and Martin Rockall (trumpets), Nicholas Firth (horn), Kevin Pitt (trombone) and Eddie Connor (tuba) - formed, in the early 1980s, the Cambrian Brass Quintet, which did so well that they became the Birmingham School of Music Ensemble in Residence in 1984-5. 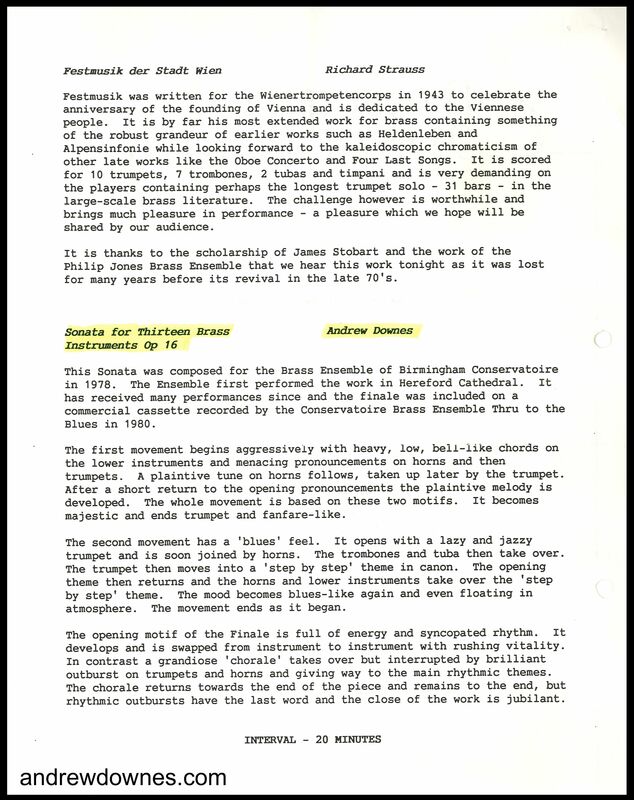 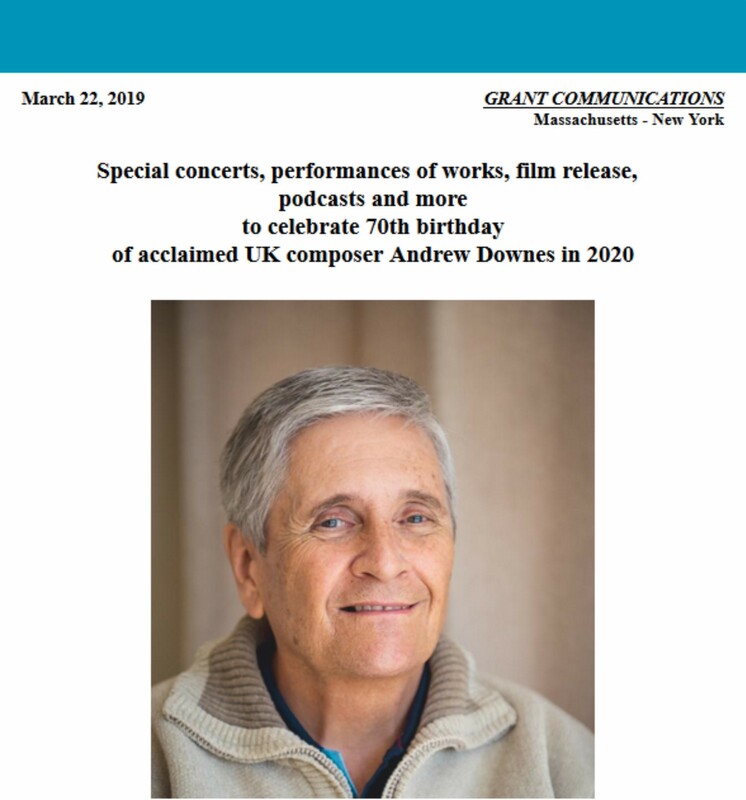 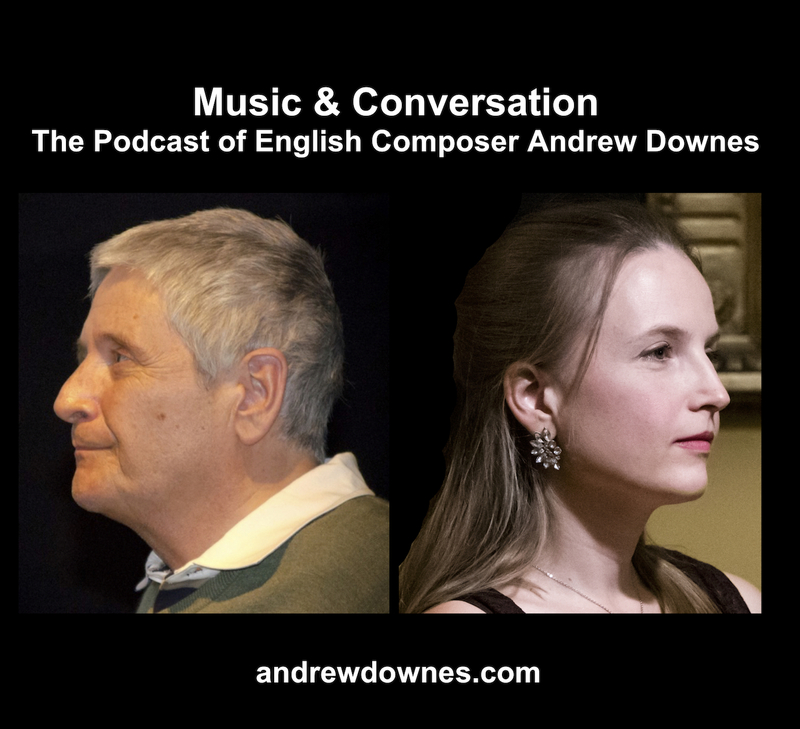 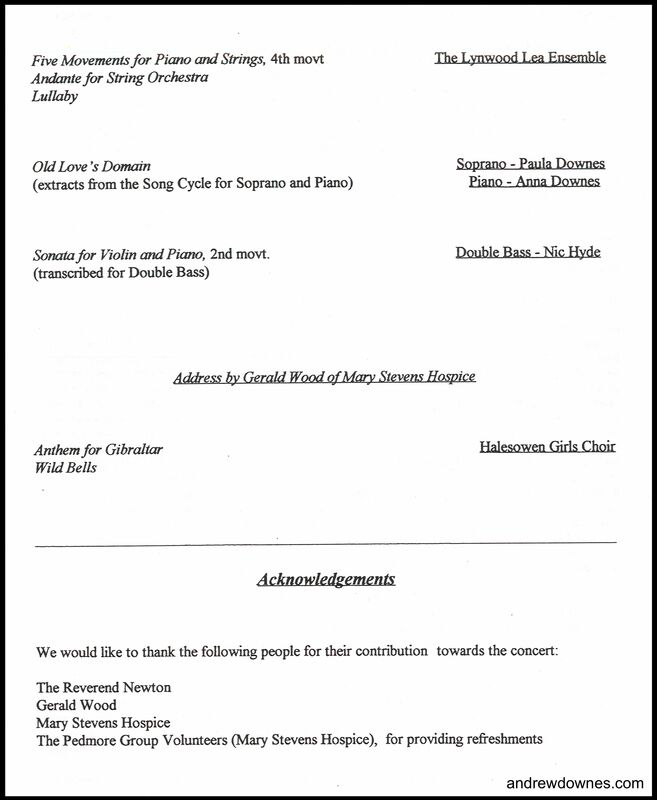 They asked Andrew to write a work to play in the many concerts which they were organising. 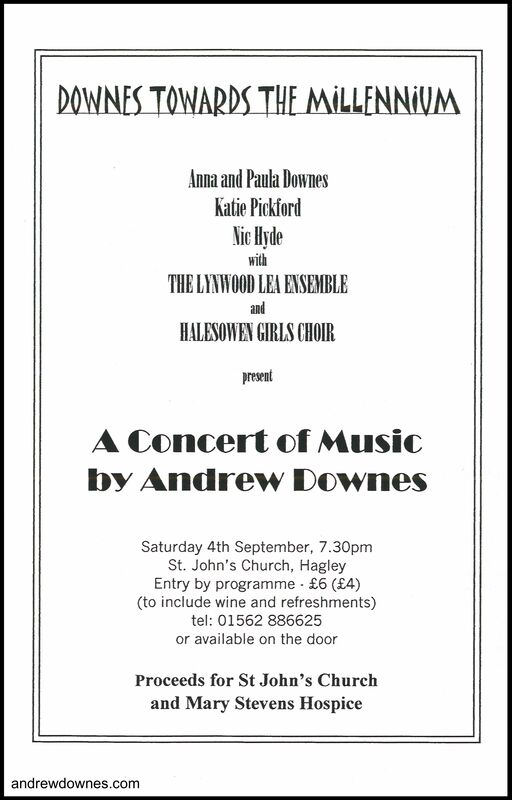 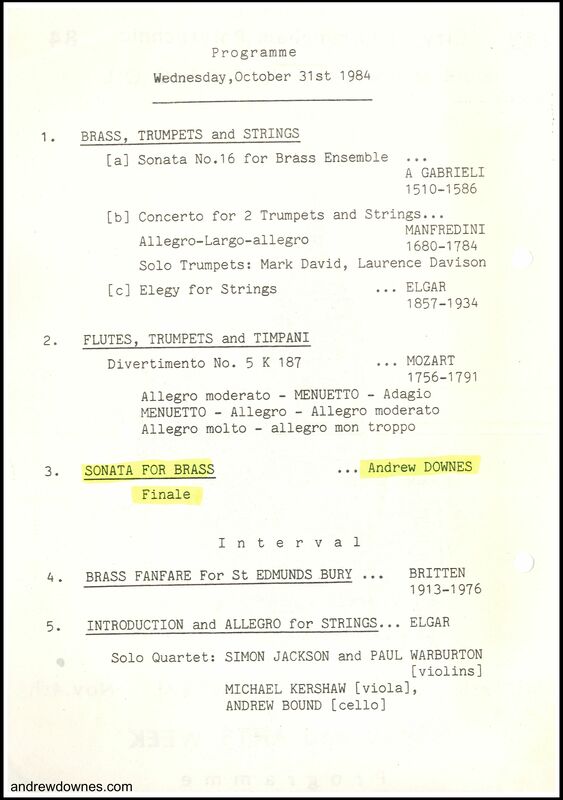 Andrew wrote his Suite No.1 for Brass Quintet, which consists of 5 movements: Pastorale, Fanfare, Elegy, Folk Dance, Epilogue. 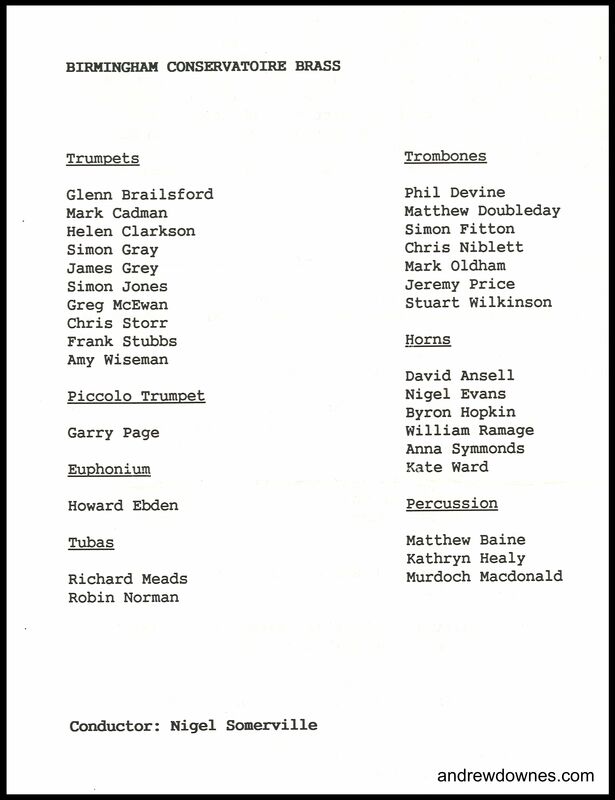 Cambrian Brass premiered the Suite at a memorial concert for Bernard Brown, well loved and brilliant trumpeter and teacher. 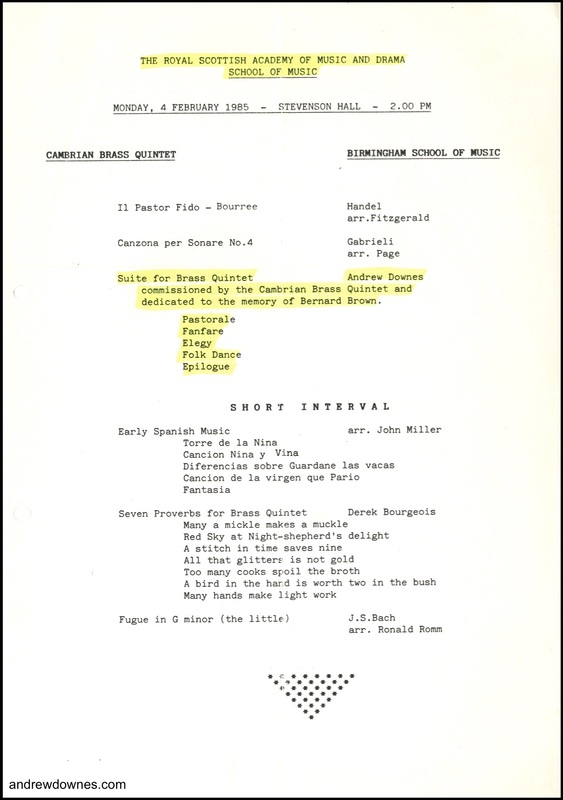 Andrew dedicated his work to the memory of Bernard Brown. 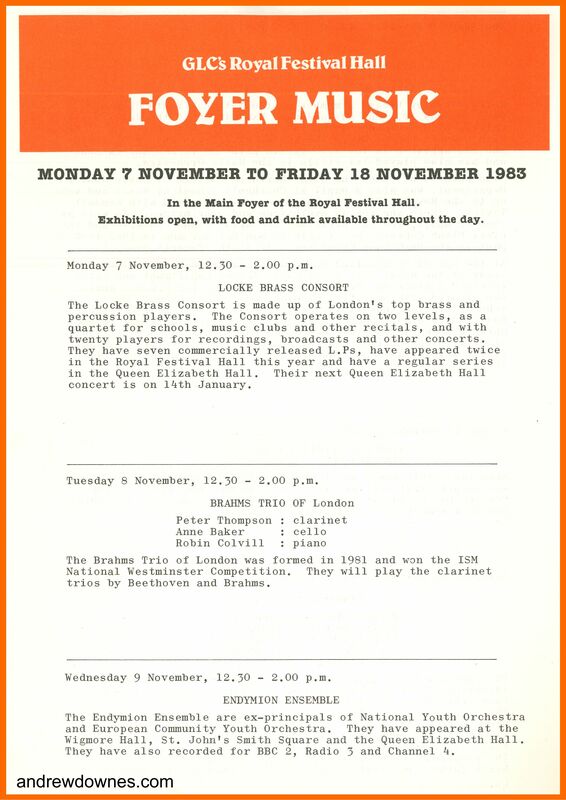 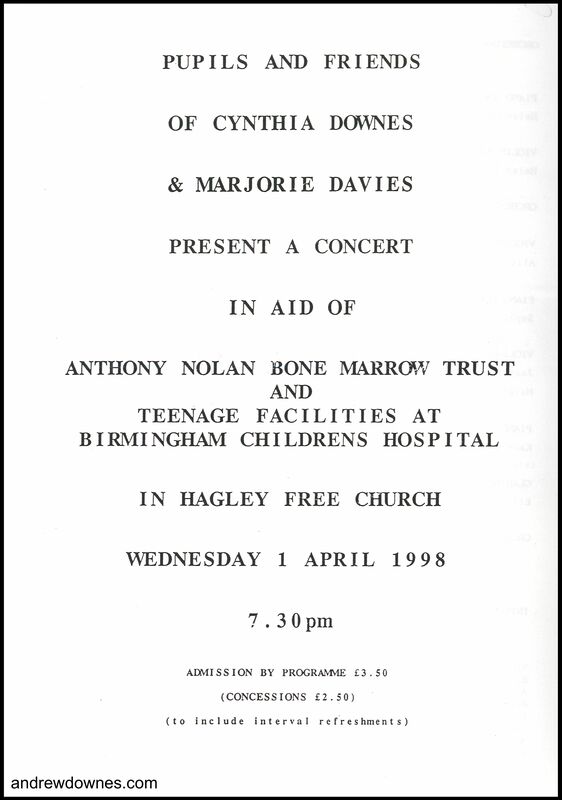 This first performance took place in Birmingham Cathedral on 9th November 1983. 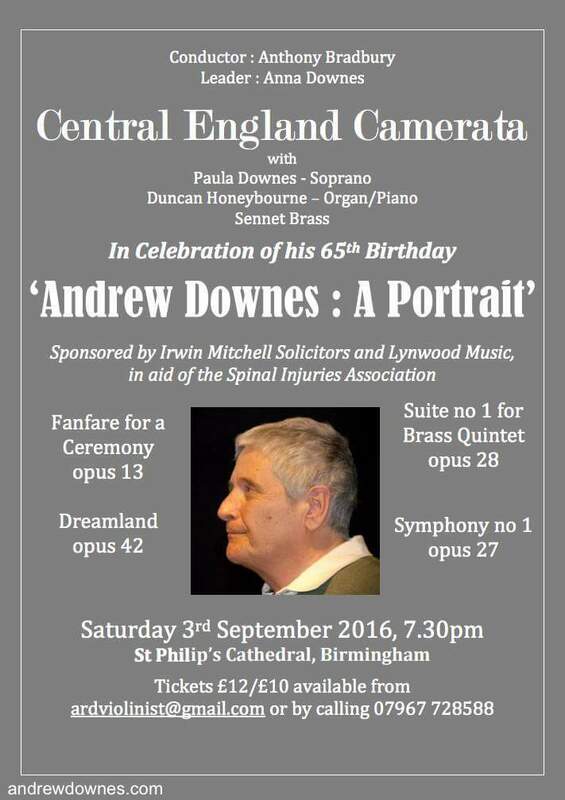 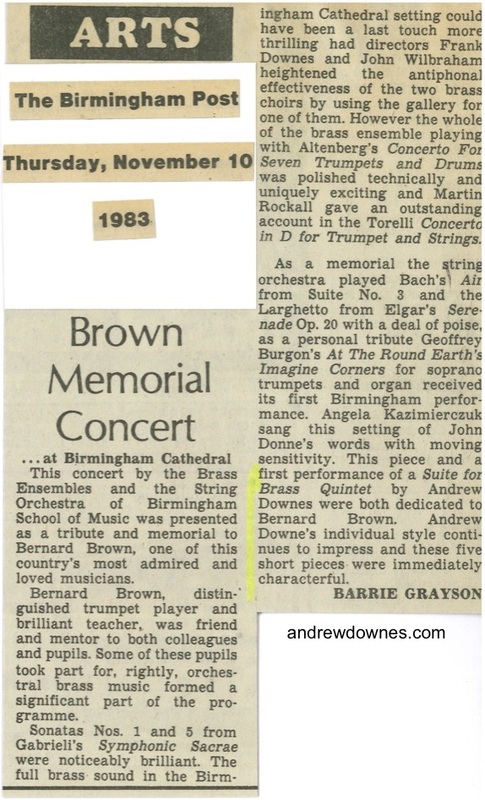 The BIRMINGHAM POST review praised Andrew's individual and immediately characterful style. 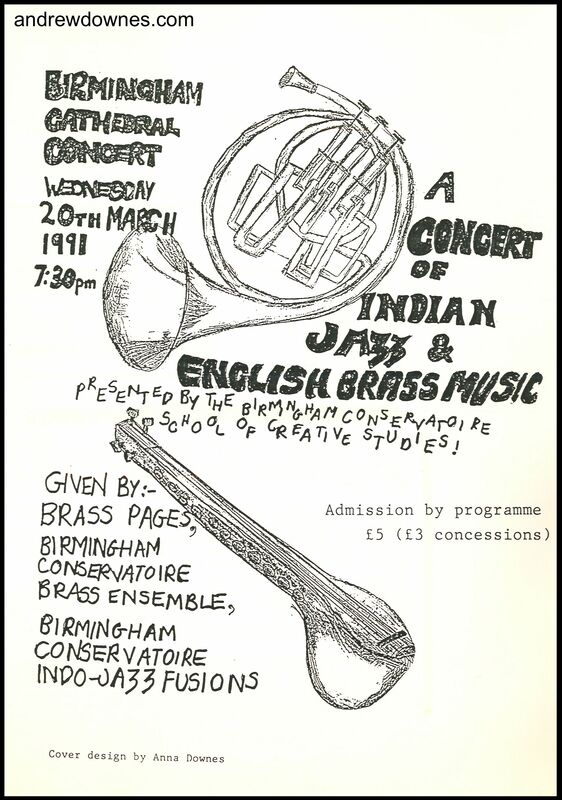 Cambrian Brass went on to perform the work in a Royal Festival Hall Foyer Concert, the Barbican Centre, the Royal Scottish Academy of Music and Drama, the London College of Music, Birmingham Cathedral, Birmingham School of Music Recital Hall and several music societies around the UK. 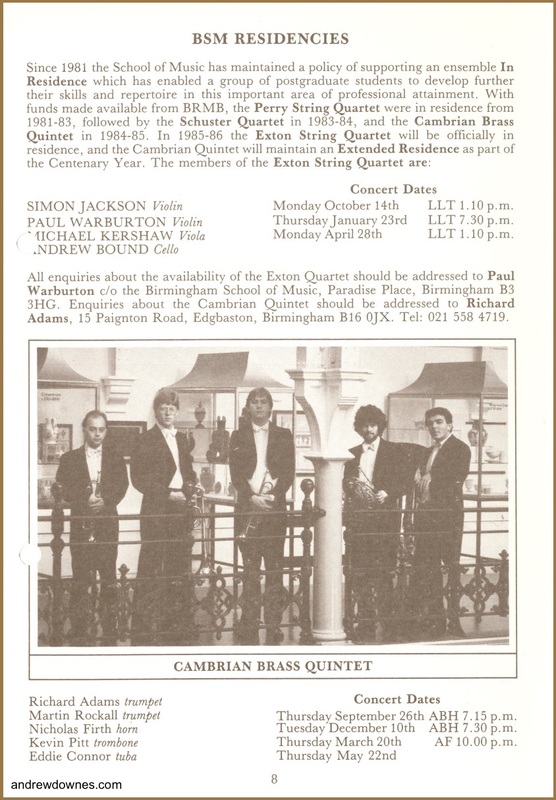 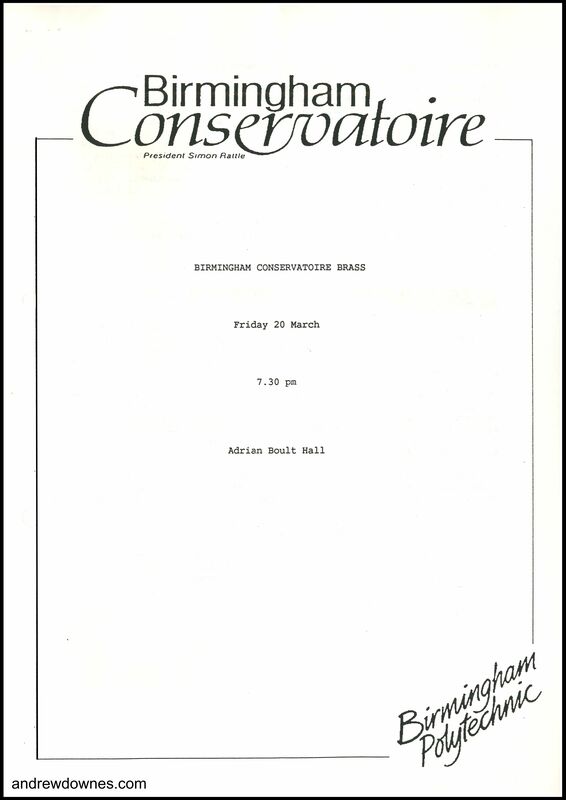 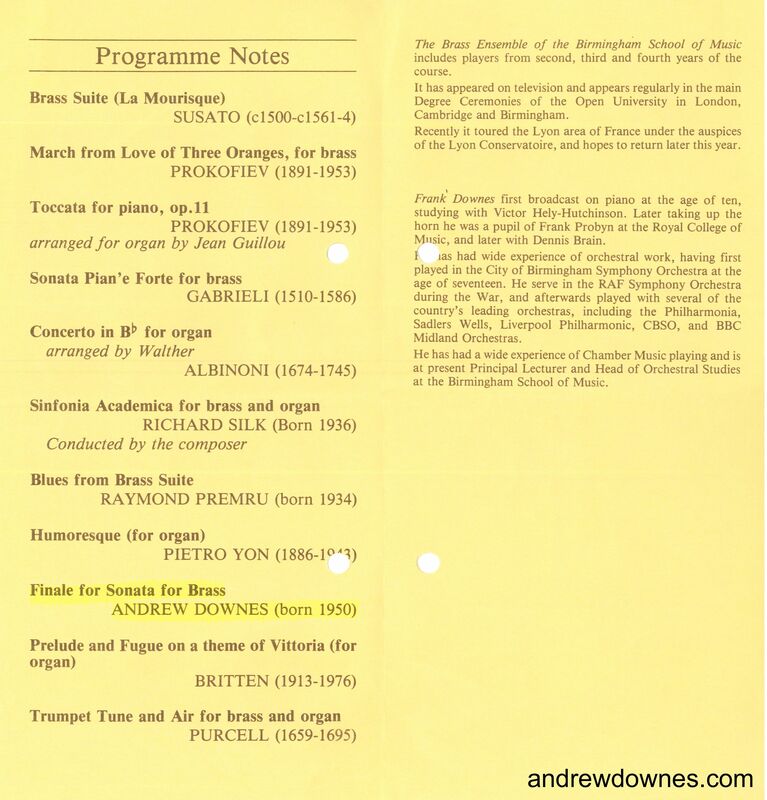 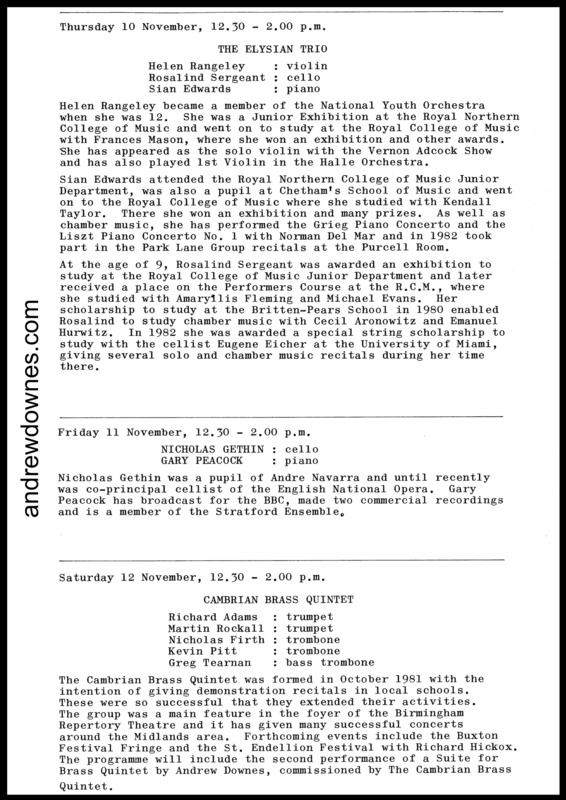 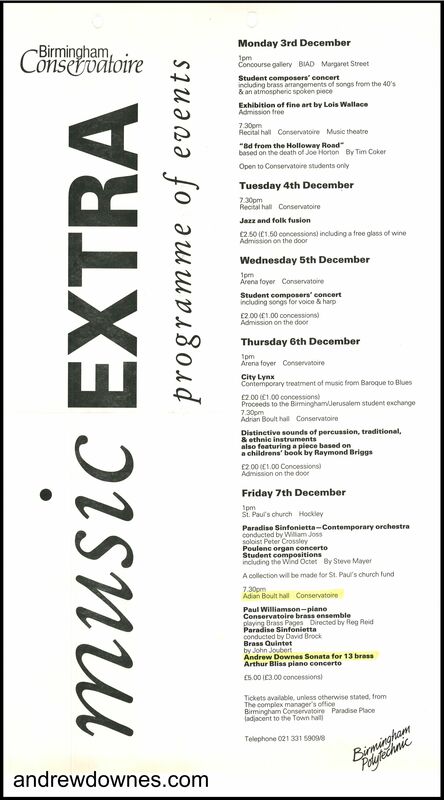 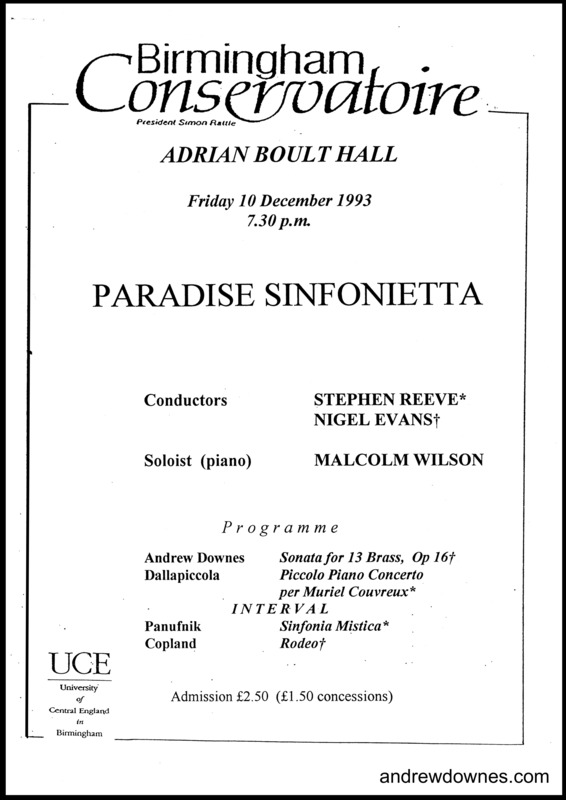 A new Birmingham Conservatoire Quintet, Forum Brass, performed the work in the Adrian Boult Hall, Birmingham in May 1992. 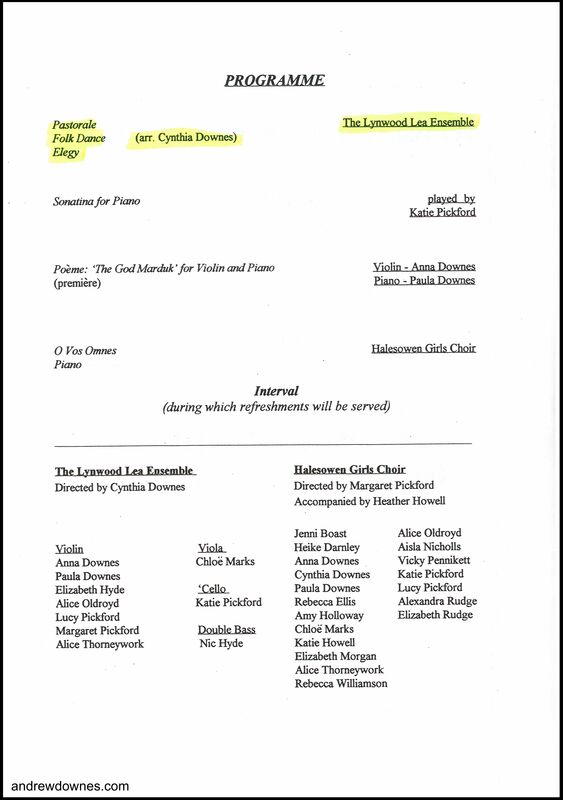 One of my pupils, Ellie Brockman, liked The Elegy so much, that she further arranged it for her group 'Essence' as a keyboard piece with cello and flutes. 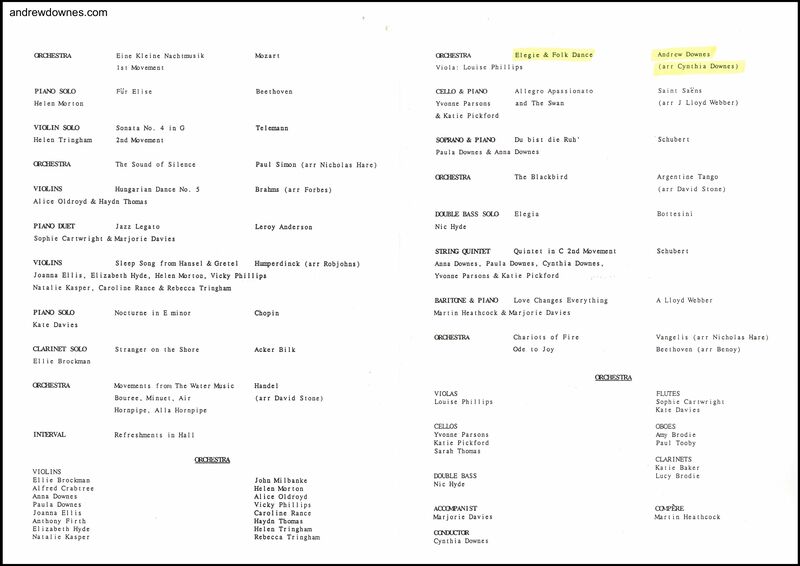 They included it on their CD, entitled Essence together, which they made in 1997.